At my favourite Farmer’s Market last week I was surprised to see bunches of baby parsnips piled high amongst the spring greens. Roasted parsnips are always well received on our dinner table so I began to formulate a warm salad to accompany an unadorned roast chicken. Working with the delicious soft sweetness of the parsnips and what I had to hand I began by thinking about crunch so I toasted pine nuts in the oven while the parsnips were roasting. Salty tidbits were my next consideration. I almost settled on uncrushed salt flakes after rejecting capers, olives and anchovies, then inspiration struck. Crisp parmesan crumbs would add extra crunchy texture plus a huge hit of flavour. Into the oven went a silicone paper lined tray covered in a very thin layer of finely grated parmesan to caramelize. I chopped parsley and snipped chives to add freshness. While the parsnips cooled a little I roughly crushed the crisp parmesan and considered a dressing. Because I’d tossed the parsnip pieces in olive oil before putting them in the oven, a squeeze of lemon juice and a good grinding of black pepper would suffice. I layered the salad into the serving bowl with a bunch of lightly steamed broccolini. It was a delicious balance of textures and flavours and a salad worth making again! Cut the parsnips in half lengthways, then cut the fat half into batons. While the parsnips are roasting, toast the pine nuts 5-10 minutes in the oven on a separate tray. Watch them closely as they burn easily. When they have lightly browned remove from the oven and set aside. Finely grate the parmesan cheese onto a baking paper lined tray and spread into a very thin layer. Bake the cheese until melted and golden, about 15 minutes. Remove and cool. Crush the cheese crisp roughly with a rolling pin. Toss the parsnips, pine nuts and parmesan together. Just before serving add the herbs and sprinkle the lemon juice over. Toss the parsnip salad then layer into a serving bowl with the brocciolini. oh this sounds yummy…parsnips aren’t my family’s favorite but in this the lemon taste might work wonderfully well. I can’t use pine nuts, do they add significantly to texture? This salad would work equally well with young carrots too Elisa. The nuts are not essential, there is plenty of crunch in the parmesan crumb. What a great combination! How I miss the farmers’ market bounty. (We still have them, but it’s mostly just meat and turnips now.) Hope you have a lovely holiday. I bake parsnips time to time, too. Definitely will make such salad next time! Thanks for sharing, Sandra! Oh Sandra this really strikes a cord with me right now. Looks absolutely delicious! I love how you caramelized the parmesan with parsley and chives. Brilliant. And you kept it simple with the dressing. It’s perfect. 🙂 Merry Christmas! You’ve just described what I miss most when our farmers markets close. No more strolling about, discovering some treasure, and then buying it with an eye to that night’s dinner. Of course, my “creation” would be nothing at all like yours here. Your salad is far and above any pasta dish that I might throw together. Love that you roasted the parsnips and included them. I must keep this in mind. Because our climate is so temperate our Farmers Markets operate throughout the year. I love seeing the seasons change, but I especially love the little surprises that form the basis of a meal. Don’t downplay your skills in the kitchen John, they are many and varied, and I for one really look forward to reading your posts! Have a wonderful Christmas…. No parsnips at my farmers’ market and not likely to be – which is sad as I love them. Fantastic combination of textures as well as flavours. You’ve got me thinking about parsnip crumbs for my festive roast parsnips. Have a lovely time over the next week and thanks for all your wonderful comments over the past year. I always read and enjoy your posts. Here’s to a flavourful 2015. What a beautiful combination of flavours! Ha! Love a post title with excellent alliteration. So many good things start with P! This sounds like a fabbo combination of ingredients, lots of lovely texture. Wishing you a wonderful Christmas Sandra. The Ps were a bonus! Have a happy family Christmas Saskia and a very restful holiday…. I am really going to make this to the tee of your specifications. I love every detail in this recipe. I think I would pass on the chicken and just have a big plate of this salad. It looks delicious. You call this salad, I call it decadent grilled baby parsnips with nuts and cheese. Just a small bowl of this will satisfy me tremendously. Beautiful recipe. Thanks Fae! Just sometimes, left of field ideas really work well! No adorable baby parsnips hereabouts either. That is a killer sounding salad. Just the tonic for your recent massive two household combining activities! Oh tht looks so good. I could eat it all right now. Haven’t seen any cute parsnips in my travels though. Love the salty crunch provided by the baked parmesan and herby bits. Thanks, it was a flash of vegie inspiration! 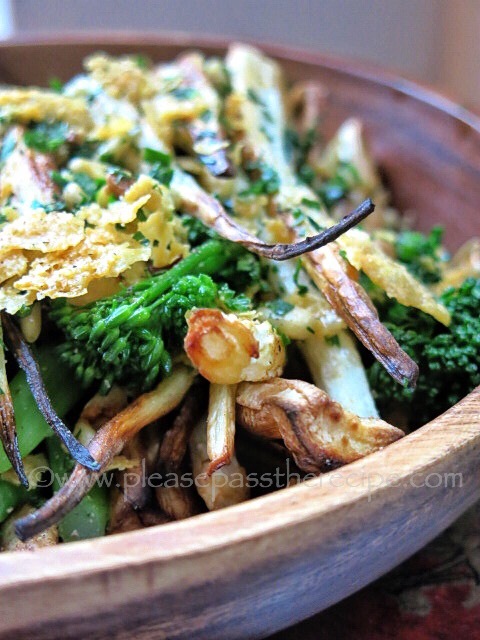 This entry was posted on December 18, 2014 by ladyredspecs in FODMAP diet, Food, Gluten Free, Light Savoury Dishes, Side Dishes & Salads, Vegetarian and tagged FODMAP diet, gluten free, parsnips, salad, side, vegetarian.